Lady and the Blog → Living → Product Reviews → I Just Signed Up For Bluebird from American Express and Walmart!! I am really excited to be working with American Express and Walmart on their launch of Bluebird. Bluebird is a wonderful new alternative to debit and checking accounts designed to help consumers better manage and control their everyday finances. Bluebird has been developed for the tens of millions of Americans who are looking for advanced capabilities such as deposits by smartphone and mobile bill pay, fee transparency, and no minimum balance, monthly, annual or overdraft fees. It’s hard to believe that all of this is even possible, doesn’t it? It almost sounds too good to be true!! Built upon American Express’ Serve platform, Bluebird’s features allow consumers to transact online and offline in the way that best suits their everyday needs. Bluebird puts people back in charge of their finances and is available in more than 4,000 Walmart stores and online. Sure, you get all the premium features you want and need like mobile phone deposits, family sub-accounts and free access to cash at 22,000 ATMs with direct deposit but you also get access to additional benefits such as purchase protection against accidental damage or theft, roadside assistance and award winning 24/7 customer service. 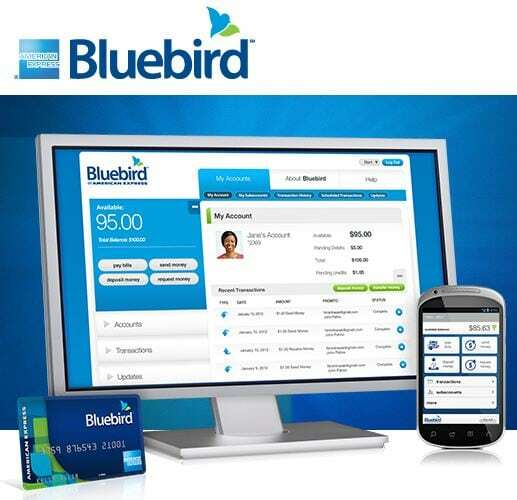 Deposit Money: Once Members register and receive their personalized Bluebird card, funds can be loaded online through a bank account such as a savings or checking account, debit cards, direct deposit, remote check capture via the mobile app and cash loading at Walmart registers. Make Purchases: Bluebird can be used for purchases at millions of locations where American Express ® Cards are accepted, both in the U.S. and internationally. Pay Bills: Members can pay bills to any person or business in the U.S., either online or with the Bluebird mobile app. Create Subaccounts: Bluebird offers Members the ability to easily create, manage and specify subaccounts for their friends, family members or colleagues. Members can set up to four subaccounts. Subaccounts are linked to the master Bluebird account and allow the user to set spending limits, set up text/email alerts, and enable/disable key features like ATM access. Transact through the Bluebird Mobile App: The Bluebird mobile app has no fee and is available on any iPhone® and AndroidTM Phone. Once installed, Bluebird Members can send and receive money, view transactions, add money, and manage subaccounts. Get Cash Access: Bluebird members can use their Bluebird Card for ATM withdrawals anywhere around the world that accepts American Express® Cards. Bluebird Members enrolled in direct deposit can get fee-free and surcharge-free cash access through the MoneyPass’ network of 22,000 ATMs nationwide. Withdrawals at an out-of-network ATM will have a $2 fee and additional fees may be assessed by the ATM owner or operator. For Bluebird Members not enrolled in direct deposit, each ATM withdrawal at any MoneyPass ATM nationwide will have a $2 fee. Note: The $2 fee is waived until November 4, 2012. Purchase Protection1 which can provide coverage against accidental damage or theft of eligible items for 90 days from date of purchase, up to $1,000 per occurrence, up to $50,000 per Cardmember account per calendar year. Roadside Assistance2 which may arrange for the following services: towing, winching, jump starts, flat tire change when spare is available, lockout service when key is in vehicle and delivery of up to 2 gallons of fuel. Global Assist® Services3 provide pre-trip planning assistance as well as emergency assistance when the Cardmember is traveling more than 100 miles from home. Exceptional 24-7 customer service Members have come to expect from American Express. Initiate Bluebird to Bluebird Transfers: Immediate person-to-person money transfers to other Bluebird Members can be conducted online or via the Bluebird mobile app. nquire about their balance 24 hours a day/7 days a week. And if that’s not enough, over the next year, Bluebird will offer additional features, such as additional deposit options and check-writing capabilities!!! I’ve already signed up online at wwwbluebird.com for my new account. It took about 5 minutes, literally…and I’m just waiting for my new Bluebird card to arrive in the mail. It could not have been easier to do. Please keep checking back here because I will be keeping you posted over the next month or so how it goes and if it works as wonderfully as I think it will!!! Lady and the Blog LLC has received compensation for this and any subsequent Bluebird-related posts. All opinions are that of Vera Sweeney and Lady and the Blog LLC. RUN, RUN, RUN this card is the WORST!!!!! you are on hold for at least 45 min. then they keep transferring you around, then thephone goes dead. I put in the wrong pin code 1 time and they locked my account, it has now been 8 hours calling aback and forth, I have verified everything and my acount is still locked, thank GOD I’m not in a emergency situation right now.